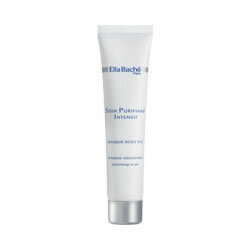 Ella Bache Purifying Balance Absorbing Mask Intex No 2 is formulated with absorbent kaolin, astringent thyme and halibut oil. This makes Ella Bache Purifying Balance Absorbing Mask Intex No 2 an extremely effective treatment that can purify and mattify severely oil prone skin, for a smooth, soft and fresh complexion after each application. Ella Bache Purifying Balance Absorbing Mask Intex No 2 is also perfect to use as an intensive patch treatment on blemishes to condition and remove.